Last night we made our way to Macedonia's Alexander the Great Airport for our flight to Cairo. It was actually two flights: Skopje-Istanbul and Istanbul-Cairo. We had about 90 minutes between flights and they were both Turkish Air so we didn't anticipate any problems. How silly of us! Our Turkish Air flight to Istanbul left very late because the Turkish Air flight we were to take arrived in Skopje very late. We arrived in Istanbul after 12:30 a.m. which was after our connecting flight had already left. The Turkish Air Transit Desk was overwhelmed with passengers with the same problem--missed connections to all parts of the world. When we finally got our turn, we gave the Turkish Air employee our information; she told us to take a seat across the terminal from her desk. We waited and waited, and we watched new waves of disgruntled passengers queue up or usually just mob the Turkish Air Transit Desk. Finally, feeling forgotten, we got back in line. After quite a bit of waiting, we were finally rebooked on an afternoon flight and sent to Turkish Air's Hotel Desk. To get to the Hotel Desk, we had to buy a visa ($20 each) so we could leave the airport. At the Hotel Desk, we waited some more with other delayed passengers. Finally, our names were called, and we boarded a shuttle bus to a "5-star hotel" somewhere in greater Istanbul. Around 3:30 or 4:00 a.m. we arrived at our hotel which was at least 45 minutes from the airport. We checked in, and I asked for and was given a toothbrush and toothpaste. Because our carry-on bags consist of camera equipment and our laptop, we had no other toiletries or clothing other than what was on our backs. 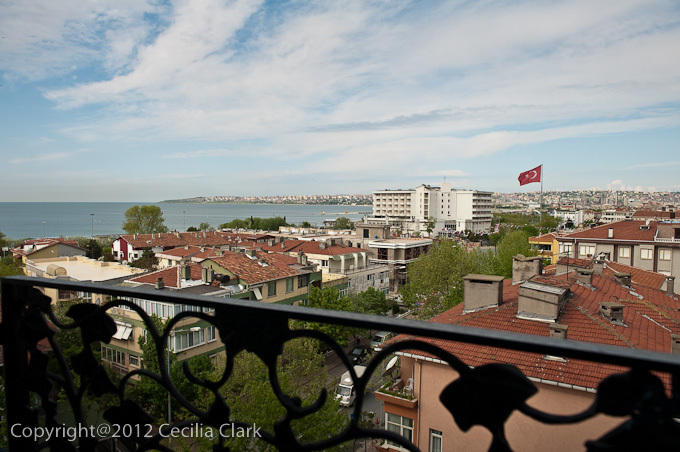 This morning we woke to a beautiful view of the Sea of Marmara. Our room was very nice and the bed was two king sized beds. We have no idea where we were. Turkish Air told us a shuttle bus would pick us up at 11:00 for our 2:00 flight. We waited. The shuttle bus finally showed up about 11:30, but it was a van not a bus. Once the other passengers got in with their bags, there was no room for us. The driver said he'd call another van for us. Again, we waited. Finally fearing that we would miss yet another plane, we took a taxi to the airport. Our flight was left late so our worries were for naught. Our baggage did not arrive with us at the Cairo Airport. Egypt Air filled out reports for the missing luggage and they paid us a "baggage delay" allowance of 200 EGP ($33 USD). One thing that did work well was our Cairo hotel, the Hotel Longchamps. We asked for a driver to meet us at the airport, and he was there with a sign. He had a nice car with air conditioning and whisked us to the hotel. Our room was serene and quiet. After checking in we went in search of a change of clothing. It was lovely to be back in Zamalek. We each bought a shirt and I found a pair of denim capris. After dinner at Abou El Cid Restaurant, we found The Body Shop recently opened in Zamalek on 26th July, and I bought makeup. Interestingly, there are several new shops in Zamalek opened post revolution. There is a fancy cupcake shop (Nola's Cupcakes) on Brazil St and a Gourmet Food Shop with Australian beef and Norwegian Salmon. And, some of the old shops have remodeled their old spaces.